Citizenshipworks is an online service that guides you safely through every step of your citizenship application. 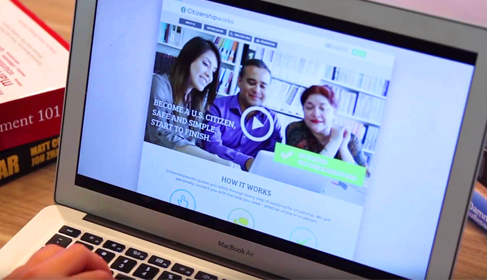 With a Citizenshipworks account, you can fill out your entire application online. If there are any potential problems, we will connect you to the legal help you need. Go at your own pace. Save your information along the way, and we will tell you if you need legal advice before you apply. You can even get online legal help. With an account, you can set up an appointment and video chat with a lawyer. Do you want to talk to an immigration expert in person? We can connect you with an organization near you. A personalized path to citizenship. Citizenshipworks helps you become a U.S. citizen, step-by-step. Our goal is to answer all your questions, and connect you to the help you need online or in-person. Based on decades of legal expertise, we make applying for citizenship safe and simple, start to finish. We are mission driven and donation based. Citizenshipworks offers solutions for nonprofit legal services providers, nonlegal community-based organizations, and individuals who want to apply for U.S. citizenship. Citizenshipworks is a collaboration between the Immigration Advocates Network, Immigrant Legal Resource Center, and Pro Bono Net. We aim to make the immigration system accessible to everyone through user-friendly technology, plain language legal information, and a national network of nonprofit immigration service providers. Citizenshipworks is funded by donations from people like you. Our goal is to help all people on their path to citizenship. Please donate so we can continue helping others. Our visionary funders support our goal of improving support for naturalization through technology and collaboration.